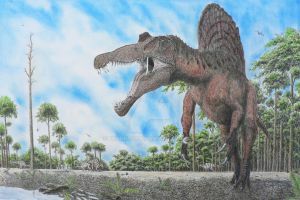 Sinotyrannus is one of biggest chinese predators. It was 10 metres long, a huge,dangerous predator. 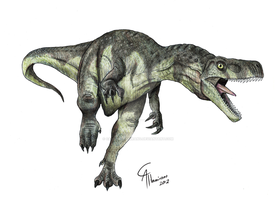 It was the biggest proceratosaurid,the family from which the tyrannosaurid evolved. Sinotyrannus means chinese tyrant. 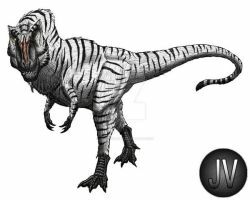 Like other proceratosaurids like guanlong,, the animal may had a crest on its snout. look's like an indomimus redisign. Why is he trying to attack a plant? maybe it's playing with a plant... ? I love when artists go that extra mile to add something to their dinosaur reconstructions while still staying within the realm of scientific possibility. You didn't overdo the feathers either which I think way to many artists tend to do these days. if i may ask, is revealing the more unknown dinosaurs a speciality of yours? i think it is about time someone did. keep up the good work. very cool. i was also curious, is the Ridge Ripper you did one of the neovenatoids or an unknown beast thus far? Perhaps the neovenatorids took over as dominant predator once Carcharodontosaurs went extinct. it is a very amazing find to say the least. What a great beast! Outstanding shading! Your backgrounds are improving. I would suggest putting more into the foreground, as that branch appears naked and awkward in the corner there. Great job on the tyrannosaurid, though. The word "badass" is so woefully inadequate in this case.